Not the Convalescent Home, Coatham! 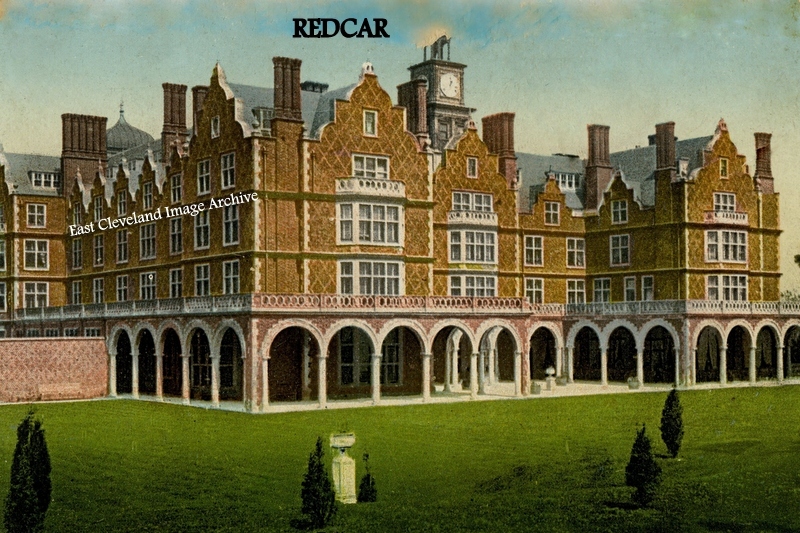 We posted this image believing it to be of the Convalescent Home at Coatham; based on the ‘REDCAR’ heading to this ‘cropped’ postcard. Our other views of the Home are from the sand dunes and the area now occupied by the open space that was the Coatham Bowl. However, following Fred Brunskill’s comments we are now appealing for any suggestions as to where in Redcar (based on the notation on the card) this building was, so please help! Dave Cusson has come to the rescue: “Surely this has to be Sir William Turner’s Grammar School on Coatham Road. If correct the photograph was taken before the addition of the cloisters; and likely enough before the School Hall was built. Chez Anderson adds: “I recall the old fever hospital on the marsh, it could be reached by walking through Barkers Holiday Camp and over the railway crossing. In the 1950’s a man lived alone there; he had a vegetable garden with hens and would visit Barkers, to sell eggs and vegetables”. Image courtesy of Iris Place and many thanks to Craig White, Mick Mavin and to Fred Brunskill for his assistance; to Dave Cusson for coming to the rescue, also to Chez Anderson for the update. In the meantime has anybody an image of the Fever Hospital; the Archive would welcome a copy to further this line of enquiry? 6 comments to Not the Convalescent Home, Coatham! Not quite sure what this building is but definately not a Redcar building. The Convalescent home was three gabled buildings interconnected of 2/3 story’s only which was later extended at the rear to accomodate children and have it’s own Chapel. Surely this has to be Sir William Turner’s Grammar School on Coatham Road. If correct the photo was taken before the addition of the cloisters – and likely enough before the School Hall was built. Sad to think the Council decided to destroy the wonderful old building leaving only the Cloisters and the Hall, both of which are now being allowed to fall into disrepair. Does anyone remember the old fever hospital built on coatham marsh, I think you could get to it via a track past barkers field? I remember a house standing in splendid isolation on Coatham Marsh, not sure if it had been a hospital. It was demolished around 1984. The demolition contractors on site where I was working at the time did the job and said they had found lots of old glass bottles in the house . Craig White. I think the large house you remember was the Fever Hospital which was located just over the bridge and then down a track into the Marsh. I recall the old fever hospital on the marsh, it could be reached by walking through Barkers Holiday Camp and over the railway crossing. In the 1950’s a man lived alone there; he had a vegetable garden with hens and would visit Barkers, to sell eggs and vegetables.